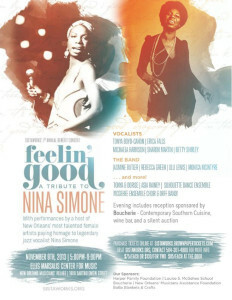 Lilli Lewis will be the pianist for “Feelin’ Good – A Tribute to Nina Simone” on Saturday, November 9th from 5-9:00 pm at the Ellis Marsalis Center for Music in the Musicians’ Village in New Orleans, Louisiana. With performances by some of New Orleans most talented female artists, the event will pay homage to legendary jazz vocalist Nina Simone. The evening celebrates the collective talents of women and girls. The event includes an opening reception with food & wine, and a full jazz concert interspersed with a variety of other artistic performances. There will also be a silent auction during the event. The event will raise funds for SISTAWorks’ SISTA Scholar Program (SISTA stands for Stay-In-School-Tuition-Assistance) which provides vital support to girls from Ghana, West Africa’s most rural areas to continue and complete their secondary school education. Performers include: Sharon Martin, Betty Shirley, Michaela Harrison, Tonya Boyd-Canon, Erica Falls, Monica McIntyre, Jasmine Butler, Lilli Lewis, Rebecca Green, Tonya & Dorise, Silhouette Dance Ensemble, McGehee School’s Ensemble Choir & Orff Band, Asia Rainey and Fiya like Ayanna.